A major milestone in the Lochboisdale Port of Entry Regeneration project has been reached. The causeway from Rhubha Bhuailt now stretches to Gasay Island and can be crossed at low water. 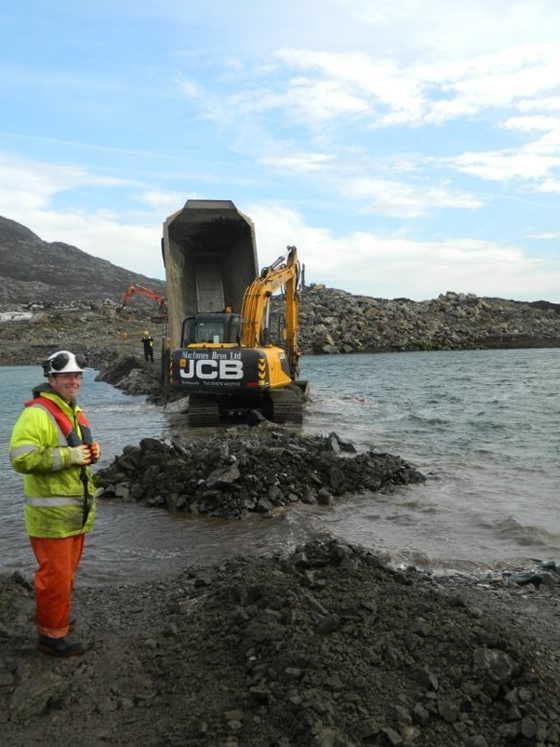 Project contractor, MacInnes Bros., will now build up the causeway to its full height and width over the coming months. 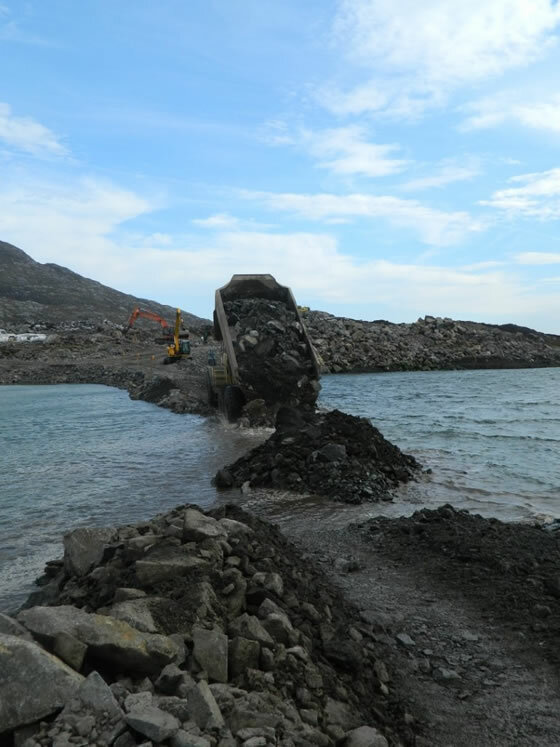 The week after the announcement of a three year trial for a Lochboisdale-Mallaig ferry service, the closing of the causeway for this major construction project is another important boost to the regeneration of the local economy. Community landowner, Stòras Uibhist, expects to attract local businesses looking to expand and new commercial tenants to Lochboisdale, which will provide employment to drive an economic revival for the area. The project, which could not have happened without community ownership, secured funding from a number of sources. Highlands and Islands Enterprise (HIE), the largest funder has supported the project through the feasibility and design stage, before committing £5m to the construction phase. Comhairle nan Eilean Siar has contributed £625k of grant funding as well as a cashflow facility to facilitate the drawdown of grant funding from HIE as well as ERDF and BIG Lottery. The construction work currently underway is scheduled to be complete by February 2015. The new 51 berth marina, with associated shore facilities, will then be ready to welcome visitors and Gasay Island will be available for commercial development. Rhubha Bhuailt will also provide land for new housing looking towards the existing village of Lochboisdale, as well as south towards South Lochboisdale. Rachel MacKenzie, HIE's Area Manager for Innse Gall, said: "The Lochboisdale Port of Entry is one of the most important projects to be undertaken in South Uist for generations and we are delighted to be supporting such an ambitious and significant investment. The Lochboisdale Port of Entry will not only create jobs and stimulate economic development but it will open the area to community, industrial and commercial development. 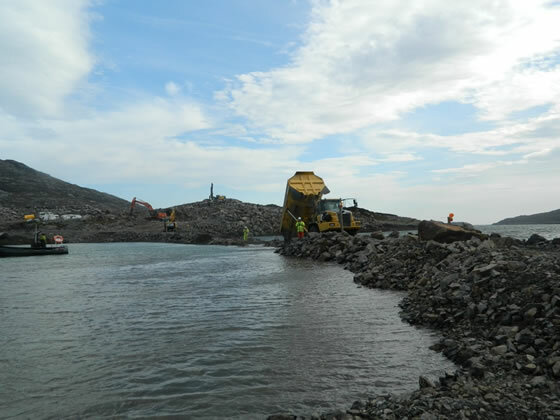 The closing out of the new causeway between Lochboisdale and Gasay is a major achievement and reaching this first milestone is testament to the hard work and determination of Stòras Uibhist, Lochboisdale Development Ltd and the entire community"